This page explains the common Lightweight Directory Access Protocol (LDAP) attributes which are used in VBS scripts and PowerShell. Programs like VBScript (WSH), CSVDE and LDIFDE rely on these LDAP attributes to create or modify objects in Active Directory. For example, when you bulk import users you will include the LDAP attributes: dn and sAMAccountName. As the word ‘distinguished’ suggests, this is THE LDAP attribute that uniquely defines an object. Each DN must have a different name and location from all other objects in Active Directory. The other side of the coin is that DN provides a way of selecting any object in Active Directory. Once you have selected the object, then you can change its attributes. Time spent in getting to know the DN attribute will repay manyfold. Observe the different components CN=common name, OU = organizational unit. DC often comes with two entries, DC=CP, DC=COM. Note that DC=CP.COM would be wrong. Incidentally, in this situation, DC means domain content rather than domain controller. Another point with the syntax is to check the speech marks; when used with VBScript commands, DN is often enclosed in “speech marks”. Even the speech marks have to be of the right type, “double quotes are correct”, ‘single quotes may be ignored’, with unpredictable results. Finally, pay particular attention to commas in distinguished names. 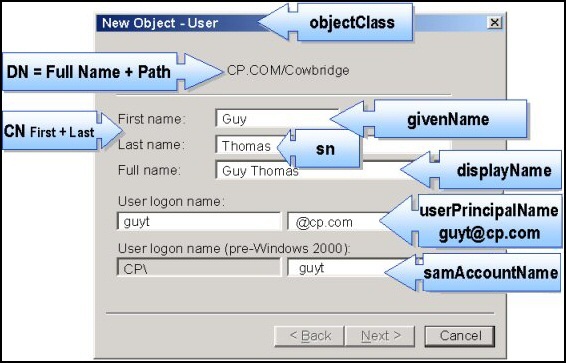 The diagram below is taken from Active Directory Users and Computers. It shows the commonest LDAP attributes for vVBSscripts. When you write your scripts, check how the LDAP attributes map to the Active Directory boxes. One of my favourite techniques is to add values in the active directory property boxes, then export using CSVDE. Next, open the .csv file in Excel, search for the value, and read the LDAP field name from row 1. C Country: e.g GB for Great Britain. CN – Common Name CN=Guy Thomas. Actually, this LDAP attribute can be made up from givenName joined to SN. CN Maps to ‘Name’ in the LDAP provider. Remember CN is a mandatory property. See also sAMAccountName. description What you see in Active Directory Users and Computers. Not to be confused with displayName on the Users property sheet. displayName displayName = Guy Thomas. If you script this property, be sure you understand which field you are configuring. DisplayName can be confused with CN or description. DN – also distinguishedName DN is simply the most important LDAP attribute. initials Useful in some cultures. name name = Guy Thomas. Exactly the same as CN. objectClass objectClass = User. Also used for Computer, organizationalUnit, even container. Important top-level container. sAMAccountName This is a mandatory property,sAMAccountName = guyt. The old NT 4.0 logon name, must be unique in the domain. 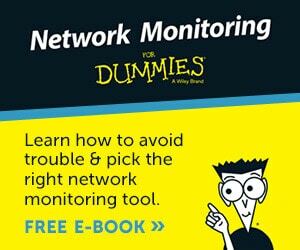 sAMAccountName If you are using an LDAP provider ‘Name’ automatically maps to sAMAcountName and CN. The default value is same as CN, but can be given a different value. SN SN = Thomas. This would be referred to as last name or surname. title Job title. For example Manager. userAccountControl Used to disable an account. A value of 514 disables the account, while 512 makes the account ready for logon. userPrincipalName userPrincipalName = guyt@CP.com Often abbreviated to UPN, and looks like an email address. Very useful for logging on especially in a large Forest. Note UPN must be unique in the forest. mAPIRecipient – FALSE Indicates that a contact is not a domain user. mailNickname Normally this is the same value as the sAMAccountName, but could be different if you wished. Needed for mail enabled contacts. 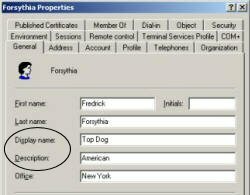 proxyAddresses As the name ‘proxy’ suggests, it is possible for one recipient to have more than one email address. Note the plural spelling of proxyAddresses. targetAddress SMTP:@ e-mail address. Note that SMTP is case sensitive. All capitals means the default address. showInAddressBook Displays the contact in the Global Address List. location Important, particularly for printers and computers. CSVDE -f Exportfile.csv. Then open Exportfile.csv with Excel.exe. Alternatively, use ADSI Edit and right-click the container objects.